When selecting the components to make up your zip wire, one of the things for consideration is whether or not you choose to use a seat harness or a full body harness. As much fun as zip wires are, safety must be first and foremost in using a zip wire. 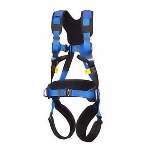 Therefore we have put together a range of safety harnesses for both children and adults. The difficulty with safety and young children is that they are continually growing and in most cases will not have developed any hips yet which are needed if wearing a seat harness. 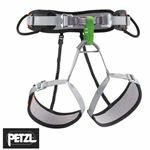 For this reason we offer a number of fully adjustable full body harnesses which are much better suited children to use. For adults the choice will be mainly down as to how you want to use your zip wire and is very much a personal choice as to which one to use. Some people prefer the easiness of a seat harness, others prefer the security afforded by a full body harness. Whichever one you decide on going with, we have put together a range of both and there should be something in the range to suit everyone's choices.